Intelligent Charging Management:Detect regularly the electric quantity of all the batteries stored in the battery room and conduct the charging and supplemental charging intelligently according to the electric quantity of the batteries. Screening of Outdated Battery:Adopt proprietary patented technologies, battery internal resistance measurement method and health status measurement method, to measure online the internal resistance and health status of the each single battery, thus achieving the real-time monitoring on the battery's health status. Networking Remote Management:Achieve the centralized management on the charging maintenance equipment of the battery via RS485. Fault Alarm Function: Monitor the single battery in real time and gives the alarm immediately when discovering that the battery's capacity, voltage, internal resistance and the like exceed the warning values. Data Analysis & Comparison: The system automatically stores the battery's data of each time period and helps the management personnel to know timely the performance of each single battery via the strong data analysis & comparison function. 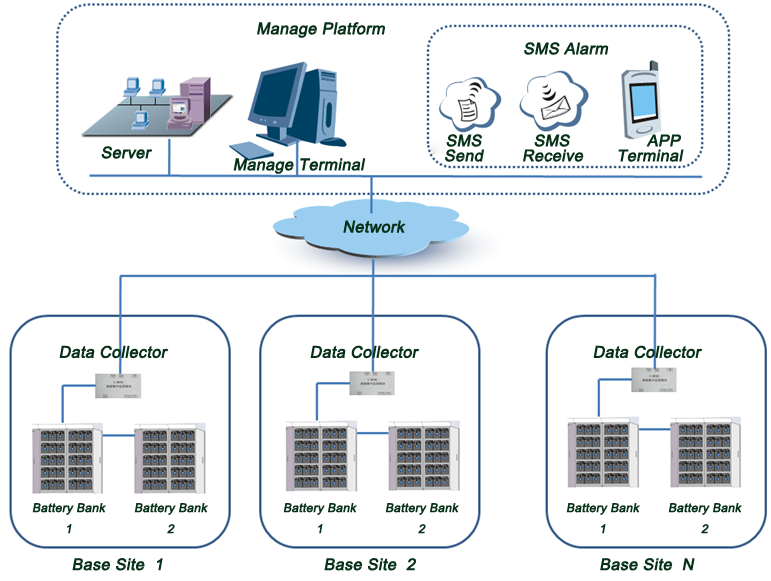 Data Inquiry Management: It has inquiry function for the battery's data like historical data, real-time data, alarm data, operation parameters. 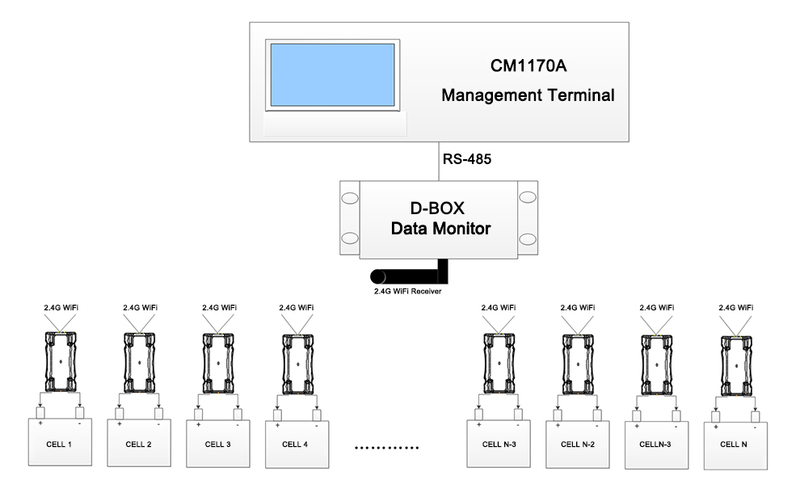 This 12V Smart Battery Remote Monitor System is computer-based battery monitoring system which combines wireless communication with patented, field-proven battery monitor and analysis technology. It not only has the ability to wirelessly control battery, but also has the ability to monitor battery's State-Of- Health(SOH) in real time. The Battery Monitoring Intelligent System named 12VBiS01 has the function of intelligent automatic supplemental charging and can guarantee the health status of the battery all the time, thus improving the battery's emergency guarantee capability in case of emergencies. How our Battery Remote Monitor IOT works? it is comprised of 3 base hardware devices and 1 software operation system. The monitor parts connected with batteries pack and reliably reports battery State-Of-Health(SOH) to the software platform. Wirelessly enables these monitoring hardware to connect and exchange data with users in working to control the batteries status in real time. The system is comprised of the management layer, data communication layer and data collection layer. Management layer: Formed by the server system, management terminal and the like, the management layer is used to detect remotely the working status of each battery pack, master timely the status and performance indexes of the single battery, analyze the battery`s performance status and conduct the intelligent charging management and battery maintenance management according to the battery status; in the meantime, it can make the data statement according to the battery data so as to compare and improve the battery management efficiency and effect, thus reducing the operation risks. Data communication layer: Formed mainly by the networking transmission equipment, the data communication layer interlinks the data communication and transmission between the data center and each battery device via the data network or GRPS, etc. Data collection layer: The data collection layer mainly includes the battery`s intelligent maintenance management equipment terminal. It is used to collect the data of the battery pack like voltage, current, internal resistance and accept the orders from the data center to manage the charging of the single battery and detect, maintain and repair the battery pack. Looking for ideal Battery Monitoring Intelligent System Manufacturer & supplier ? We have a wide selection at great prices to help you get creative. All the 12V Battery Remote Monitor are quality guaranteed. We are China Origin Factory of Battery Smart Monitor System. If you have any question, please feel free to contact us.